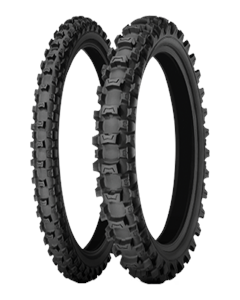 Developed for intermediate to soft tracks, Starcross MS3 tires helped win five MX2 World Championships. Starcross MS3 tires deliver the best traction of all Michelin® motocross tires on loose dirt, thanks to their widely spaced knobs. The Starcross®MS3 tire excels in steering precision and braking performance.